It is natural to get nervous before surgery. While oral surgery is less serious than most other types of surgery, that doesn’t make the pre-surgery anxiety you are feeling any less serious. However, the team at University Dental Family Dentistry and Orthodontics wants to help ease any tension by providing you a guide for how to prepare for oral surgery. If you have any further questions on oral surgery preparation, contact us by giving us a call at (619) 582-4224. There are a number of different reasons a dentist will have you undergo oral surgery but below are a few of the most common reasons for oral surgery. Make sure you are familiar with the drinking and smoking rules before your surgery, especially if the oral surgeon is using general anesthetic or intravenous anesthetic. In general, avoid drinking water for eight to twelve hours before your scheduled surgery and avoid smoking at least twelve hours before your scheduled oral surgery. After the surgery, wait a minimum of 24 hours before you resume smoking. Make sure not to drink any fluids through a straw after the surgery, as this can lead to a dry socket, and avoid alcohol for at least 24 hours after the procedure. Depending on the surgery, your surgeon may ask you to fast the night before the surgery. Even if they do not ask you to fast, it is generally accepted that you should not eat anything at least 8 hours before the oral surgery is going to be performed. If for some reason your doctor does permit you to eat before the surgery, make sure to thoroughly brush and floss your teeth after you eat to reduce the amount of bacteria in your mouth. Post surgery, your oral surgeon will prepare a diet that you must follow for a prescribed amount of time. Most diets include a soft food diet that does not require much chewing or biting, but you shouldn’t eat anything until your anesthesia wears off enough that you can feel your cheek and tongue. For your oral surgery, make sure to wear your most comfortable clothing. Try to find something old and loose that you won’t mind making dirty and provides maximum comfort. Avoid putting on makeup or wearing any jewelry or contact lenses. A good tip is to also bring some chapstick or lip balm to apply after the surgery, as your lips will be very dry. 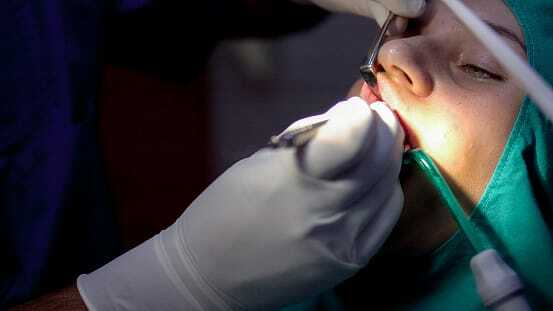 There are certain instances in which you want to consider canceling an oral surgery. Mild Cold – While a mild cold won’t totally derail a surgery, it will make it a little more difficult for your oral surgeon to work if you are sneezing and have a runny nose. You also may infect other patients or doctors, so it might be a good idea to cancel your surgery if you are getting a case of the sniffles. Allergies – With allergies, it all depends on how severe your symptoms are. If you can breathe normally and do not have intense sneezing fits, you should be fine. If you are having trouble breathing and sneezing, take an oral antihistamine before the surgery and be sure to let your oral surgeon know. The Flu – If you are exhibiting symptoms of the flu, cancel your surgery as soon as possible. If you are coughing or have a sore throat, the last thing you should do is oral surgery. At University Dental in San Diego, we do everything we can to make sure you are completely prepared for oral surgery, providing you with a plethora of information and a willingness to answer any and all questions you may have. Surgery is never fun, but at University Dental you can rest easy knowing you are in experienced and capable hands. If you are in need of an oral surgery to address a dental issue, contact us today by giving us a call at (619) 582-4224.